Along S.E. Harney Drive, just east of 45th Avenue, at the southern edge of Errol Heights Park, a family of beavers resides. Although they're not seen, there is evidence they're there – such as good-sized trees felled by chewing, and beaver dams along Errol Creek. Another confirmation was the flooding of the Errol Creek wetland this summer – even in a low-water-flow season – which caused water to rise above the walkway behind the Franz Bakery Outlet shop nearby. Portland Parks & Recreation (PP&R) "Land Stewardship Division Natural Resource Ecologist" Christian Haaning agreed with the evidence. "We believe there is a family of beavers at the site; most likely a mated pair of adults, and this year's offspring – with upwards of six in a litter – most likely with a few females from last year's litter. "The current beaver activity in Errol Creek is relatively recent – estimated at around ten years," Haaning told THE BEE. "But given the topography of the landscape, and the hydrology of the springs, this area has most likely been home to beavers for countless years before development begin in the Johnson Creek Watershed." Beavers stay in this relatively populated area, near commerce and manufacturing, because they are nocturnal in nature, Haaning explained, which may account for their relative tolerance of development. Also, waterways and wetlands favored by beavers have been altered by human development – such as culverts under roadways, channelized streams, storm water quality facilities, and wetland mitigation projects. "These modifications provide ideal locations for beavers to build dams; and beavers are highly adaptable animals that create their own habitat in many urban landscapes," Haaning remarked. 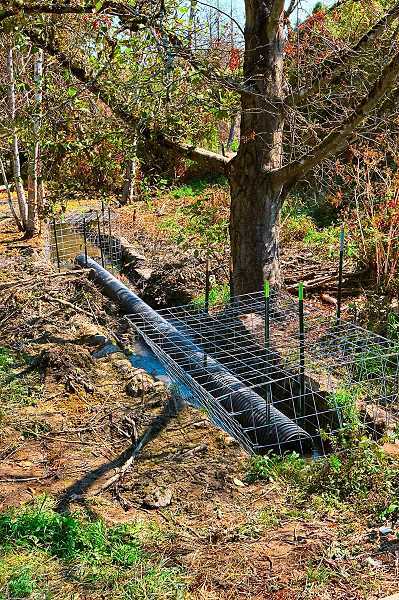 Of course, PP&R doesn't hunt or trap these neighborhood critters; instead, they've come up with ingenious ways to help beavers coexist with their human neighbors. "A 'deceiver', in this case, is a contraption designed to allow the dam to stay in place – but also allow the water to flow, and not block a culvert and cause a flood," Haaning clarified. "In this case, we used a pipe through the dam, and a cage contraption which allows water to continue to flow downstream. It allows the beaver to still maintain its dam, while the culvert remains unblocked, thus managing the water level at the site." Solutions such as these, she says, are a good example of how beavers can coexist peacefully with humans. "Since the beaver arrived, the ecological uplift to this area is immeasurable and dramatic. The intention of both Bureaus is for the beavers to continue to thrive at this location, and also to protect adjacent properties and infrastructure." And a little beneficial deception should help.